Superb revised edition of the class! This class for D&D 5e clocks in at 20 pages, 1 page front cover, 1 page editorial/ToC, 1 page SRD, leaving us with 17 pages of content, so let’s take a look! This review is based on V.1 of the file. The alchemist class comes with a sufficient array of introductory fluff, quick build rules and then proceeds to provide the respective crunch: The previously missing plusses have been added to the proficiency bonus and the notation of the HD, 1d8, now also 100% conforms to D&D 5e standards. Proficiency-wise, alchemists gain simple weapons, blowgun, hand crossbow and net as well as Aachemist supplies plus herbalism or poisoner kits. Saving throw proficiencies, fittingly, would be Con and Int and skill-wise, two from Arcana, History, Investigation, Medicine, Nature, perception and Religion are available. The starting equipment choices are sufficiently varied and allow for a nice array of customization and properly adhere to the standards established. Alchemist spellcasting works a bit differently – while they gain cantrips, they refer to their spells as mixtures. While alchemists do gain 7th, 8th and 9th-level mixture slots, these only can be used to trigger or empower formulae from 1st to 6th level or utilize class features. Alchemist casting is a bit different: You expend a slot and then get the mixture’s effects…but you may delay the onset/use of the mixture to a later date, with proficiency bonus denoting the cap of mixtures you can have ready to trigger at any given time. Here’s the kick, though: Creatures with an Int of 4 or higher can spend their Action to trigger the mixture – you don’t have to do so yourself! Attacks made by other characters with your mixture use their Intelligence modifier, but your proficiency bonus – this previously slightly wonky sentence is now streamlined and can’t be misinterpreted anymore. Kudos! You can prepare formula to turn into mixtures on a given day equal to Int-mod +alchemist level, minimum 1. Preparing a different formula does not require a short rest, only 1 minute of preparation per formula level. You need to succeed the concentration checks, if any, for your mixtures, even if someone else triggers them…unless you have reached 9th level and 15th level, at which point you may delegate the concentration of one or two mixtures simultaneously to other characters. The governing attribute for mixtures is Intelligence. Some formulae can be prepared as rituals, provided they have the correct tag and alchemist formulae have Somatic and Material components, but no verbal components. At 1st level, you begin play with 6 1st level formulae, with each level providing +2 formulae of your choice. Formulae may be copied from spellbooks, scrolls, etc. and alchemists may attune magic items usually restricted to the sorceror and wizard classes as well as other, general spellcaster-exclusive items. 2nd level nets you more item preparation efficiency for alchemical items (proficiency modifier per day of downtime with your kit), excluding poisons or herbalism-based items. 4th level and every 4 levels thereafter (minus 20th, plus 19th) net you ability score increases. The capstone lets up to 3 creatures maintain concentration in your place. The defining feature of the class, though, would certainly the alchemical tradition chosen at 3rd level, which truly defines the class – basically, these are the domains, the archetypes of the class. Each tradition sports bonus formulae, which are added to the formula-list of the alchemist in question, with the first such tradition being the artificer. At 3rd level, they get proficiency in three toolkits and at 6th level, the jack-of-all-traditions ability – which lets you add 3 formulae from other traditions, though these do not count as bonus formulae. 10th level lets you ignore class, race and alignment restrictions for item-attunement. Additionally, you may choose to not regain mixture slots upon completion of a long rest, instead maintaining the functionality of those you already have created. 14th level becomes interesting: When you use a 7th level slot to prepare a mixture of 4th level or lower, it may be triggered twice before being expended. Long rests eliminate, as usual, both uses and rest the process. If the duration exceeds instantaneous, it can only be used a second time after the first use has elapsed. As soon as you have access to 8th level slots, you may do the same for this slot and mixtures of 5th level or lower. At 18th level, 9th level and mixtures of 7th level or lower get a different upgrade – namely, duration: It increases to 10 days!!! If it is instantaneous, the mixture may be trigger your Intelligence modifier times per day. Effects that require concentration can be suspended as a bonus action and resumed as an action. Linked gates can be reopened by resuming concentration. The second tradition would be the Herbwarden, who gains proficiency with Herbalism kits at 3rd level (which may be redundant if you haven’t chosen poisoner kit at first level) and either Medicine or Nature, with Medicine being governed by Intelligence for you. Also at 3rd level, you may use field medicine to allow a target to expend HD as though he had completed a short rest, with higher levels increasing the number of HD a target can spend. Once a creature has thus been healed, it can’t be healed again this way unless it has completed a short rest, providing a nice anti-abuse caveat. 6th level nets advantage on saves versus poison and versus effects generated by oozes, plants and plant creatures as well as increased item creation in downtime with herbalist kits, analogue to the previous archetype’s crafting-enhancement. 10th level lets you double Int-mod when making Intelligence (Nature or Medicine) checks and when making healing mixtures. 14th level’s ability has been revised and is rather cool: After a target has been healed or stripped of a negative condition or disease by you, it can choose, upon failing the next saving throw or ability check, to reroll one failed ability check or saving throw. 18th level nets the herbwarden the option to expend a 9th level slot to animate plants as a shambling mound that can be commanded via telepathy. The third tradition would be the Irezumi, most of whose mixtures are intricate tattoos. As such, they gain proficiency with tattooing supplies at 3rd level -a new kit that now comes with a base price and weight.. Also at 3rd level, the irezumi gains two cantrips from any spellcasting class. At 6th level, irezumi can create mystic tattoos in an 8-hour process. Once the tattoo is created, you can charge a number of mystic tattoos equal to your proficiency bonus. You can charge the tattoos of other irezumi, if you want to. Tattoos can be triggered by the target as an action much like mixtures and the benefits last one hour. The benefits depend upon the region: Arms grant resistance to one damage type chosen upon being tattooed, which imho could have used a finer restriction, since physical damage types and e.g. force or radiant are situationally more powerful and useful than others. Head can net you Advantage on Insight or Perception or Darkvision; Legs can provide these benefits to Athletics/Acrobatics or net +10 ft. movement and the torso nets advantage on one saving throw. 10th level allows the irezumi to grant a subject up to 2 mystic tattoos and 14th level allows you to charge a bonus formula of 4th level or lower into a mystic tattoo, allowing the user to trigger that formula. Here’s the thing, though: The formula is permanent. It is not expended upon being triggered, but any use beyond the first in a long-rest-interval incurs one level of exhaustion. I am a bit weary of this one in the long run – for as long as D&D 5e maintains the very high value of exhaustion, this is okay. As soon as a game has means of mitigating exhaustion, this may become problematic. This is just me being meta, though – so far, exhaustion remains one of the most crucial conditions in 5e and thus, this is solid. 18th level lets you create a master tattoo, which works analogue to the aforementioned tattoo, only with up to 6th level qualifying and two levels of exhaustion incurred upon repeated use. The metamorph is pretty much the Dr Jekyll/Mr. Hyde alchemist – at 3rd level, expenditure of a 2nd level slot lets these guys trigger a combined alter self/enhance ability/mage armor with a duration of Concentration, up to 1 hour – but for the duration, you gain disadvantage on a mental ability’s associated rolls. 6th level lets you use Int instead of Con to determine hit points, retroactive to 1st level, and 6th level further enhances the mutagen’s effects. At 10th level, stoneskin is added to the fray and at 14th, regeneration is added alongside better natural weapons, advantage on concentration checks and an enhanced duration. Finally, at 18th level, the benefits are further expanded. Cool one! The next one would be the poisoner, whose bonus formulae are considered to be poison effects. At 3rd level, you gain 6 doses of basic poison and now, also proficiency with the poisoner’s kit. You also get proficiency in Sleight of Hand, Stealth and may apply poisons as a bonus action (3 for ammunition). You create proficiency bonus doses of poison per day in downtime and the may be ingested, inhaled or injury and deal 2d6 poison damage on a failed save- now properly used damage-type-wise. Kudos! After a long rest, you may refine poisons not crafted by you to apply benefits to them as though they were made by you – which now, in a didactically cleaner manner, directly points towards the respective abilities. Well, yeah – at 6th level, you increase their save DC to your mixture save DC and when you harvest poison, you instead get proficiency modifier doses from a given creature. At 10th level, targets also acquire the poisoned condition when succumbing to your poisons and your poison creation quickens, now also for non-basic poisons. At 14th level, you may expend mixture slots to weaken targets versus poisons and diseases or even bypass poison immunity/resistance. At 18th level allows you to expend slots to make mixtures particularly lethal and poisons generated thus nigh impossible to negate. The penultimate tradition would be the pyromancer, who can manipulate the damage-type of evocation-cantrips and spells by changing it to one of the classic energies or physical types. 6th level provides resistance to one of the classic energy damage types, though you can change the type after a short rest. 10th level adds Int-mod to the damage of evocation mixtures and 14th level provides an array of benefits that allow you to double the radius, range or make the AoE into cones or single squares by using a 7th level slot for a 5th level or lower evocation. The 18th level ability fails to specify the level it is gained, but imposes disadvantage on saves versus 7th level or lower evocations prepared via a 9th level slot. The final tradition would the nod to ole’ Herby West, the re-animator, who gets find familiar at 3rd level and may choose a crawling claw or homunculus . Any familiar is undead, though it gains advantage on saves versus effects specifically targeting the undead. Also at this level, you double your Int-mod for Medicine-checks and gain sneak attack progression of up to +5d6 at 18th level. At 6th level, undead you create also have the advantage of your familiar and at 10th level, you gain advantage on saves versus disease, poison and fear as well as the option to use a bonus action once per activity interval to temporarily gain resistance to damage from non-magical weapons and advantage on ability checks for 1 minute. At 14th level, you can use create undead to make (or assert control over) flesh golems and revenants and at 18th level, you can make either two flesh golems or two revenants…provided, for both abilities, that you expend the high-level slot. It should also be noted that the pdf has a nod towards the intriguing Salt-in-Wounds-series (Think high, dark fantasy with a society based on the regenerating flesh of the subdued tarrasque) and advice on creating your own traditions. Editing and formatting have been SIGNIFICANTLY improved and now are top-notch. Where the rules-language wasn’t 100% perfect before, it now is. The sub-abilities no longer are italicized, which means you can easily see the now properly italicized spells. Even cosmetic and didactic complaints I nitpicked are fixed. Kudos indeed! Layout adheres to an elegant two-column, full-color standard with pretty big borders at the top and bottom and several pieces of thematically fitting art that has a photo-like-look. First, I considered it to be a bit jarring, but it rather grew on me. 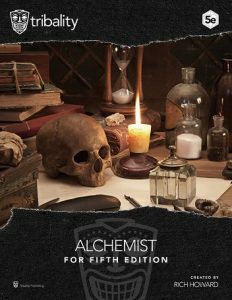 Rich Howard and Tribality Publishing have taken an already good, evocative class and sanded off teh rough edges, showing that they care for their books, rendering the new alchemist superior in every way to its predecessor. The special casting of the class and its internal nomenclature are surprisingly consistent. While I wasn’t blown away by all traditions and while I think they do vary slightly in power, I was particularly surprised by the poisoner and irezumi. While the latter can be considered to be perhaps one of the strongest options herein, it also is a class that requires the interaction with a group to prosper. And seeing unifying tattoos on a group by the same artist can be pretty cool roleplying material. If an irezumi dies and a survivor looks at the tattoo as someone asks how she got it…well, let’s just say that I think the class and its modular traditions (of which we’ll hopefully see more in the future) proved to be interesting to me. The level of care and detail that went into updating this pdf and the significant improvements make this revised edition now well worth 5 stars + seal of approval. You can get this cool base class here on OBS! Want to support Tribality Publishing directly? Here’s the patreon! Intrigued by Salt-in-Wounds? Here’s the patreon!